It’s been a long time since I’ve been to a baby shower — even longer since I had one. (My “baby boy” is 30 and my “baby girl” is 27.) How time flies… and how quickly babies grow up! Awhile back, Jenna announced that their bundle of joy is a sweet lil’ girl and it made me think of a nursery rhyme I used to read to my own daughter. In a large bowl, mix together dry ingredients with a fork. Add dried fruit; mix to coat. Add heavy cream; mix just until dough gathers around the fork. Turn dough onto a floured surface. Knead briefly (about 5 seconds); pat into a circle. Cut dough into wedges; transfer to an ungreased baking sheet. Brush tops with heavy cream and sprinkle with coarse sugar. Bake 10 to 12 minutes until tops are golden; cool on a wire rack. If you’re in the mood for something “sweeter,” drizzle with powdered sugar icing, if desired. In closing, I’d be remiss if I didn’t give something to our “sweetest” guest of honor — baby Alice! A is for angelic — a gift from heaven above. L is for the little things Mom will come to know and love. I is for the intricate way God wove you in her womb. C is for your countenance that will light up every room. E is for eternal — you’re in Mom’s heart to stay. Hello there, dear sweet Alice — Happy Baby Shower Day! I love scones! They’re one of my favorite things to bake and your recipe is a little different from the one I use. Can’t wait to try it! What a delightful gift for a new baby. I was traveling and am just now getting around to reading all the other shower posts! Yummy! I will have to try those scones sometime soon. I also love the poem. It’s fun connecting with all of you through this shower! These are the perfect scones to bring to the shower! ANd the name alone adds extra cute/delicious factor. aaaaah so sweet! and you had me at cardamom! Lovely as always! My “baby” just turned 13…yikes! Great Post! 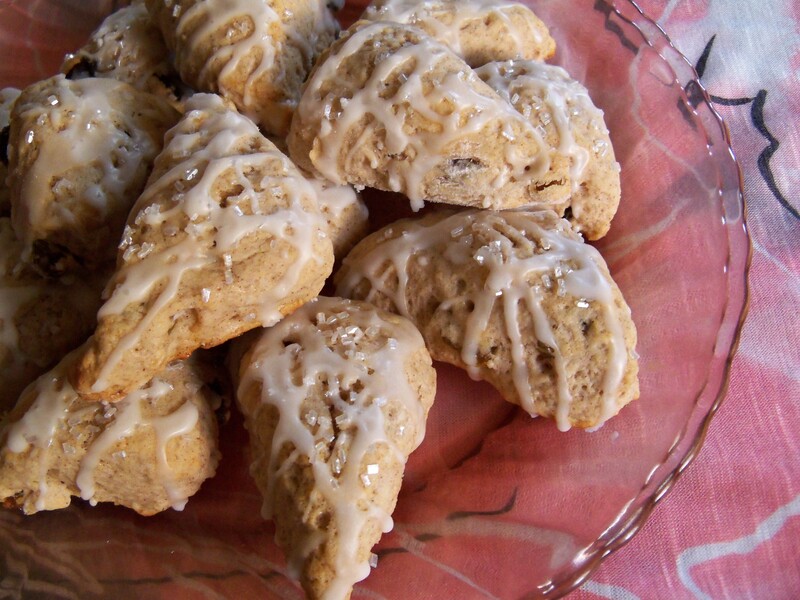 These are some mighty yummy looking scones! Thank you, Kathleen! So pleased you could join us — and Jenna — for her special day! Hi, Uru! 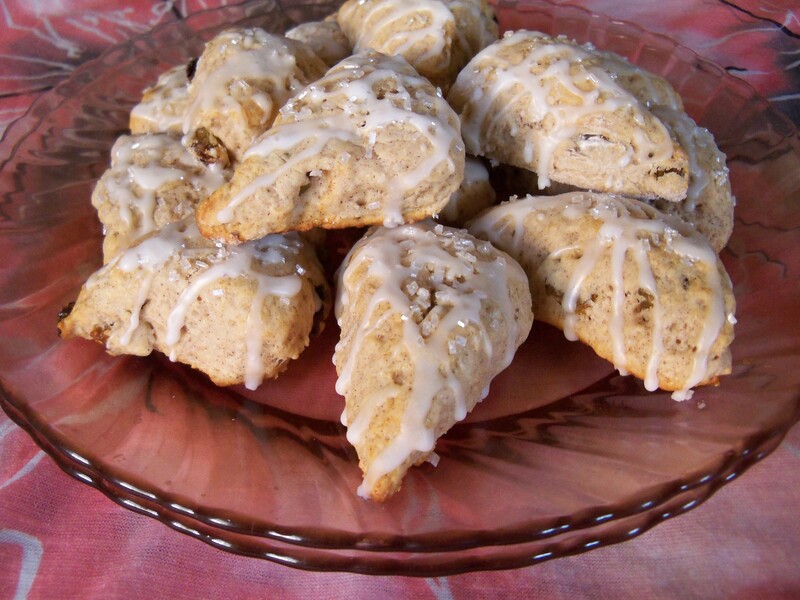 The only thing these scones are missing is a healthy dose of your clotted cream… :) Thanks for commenting, my friend! P.S. 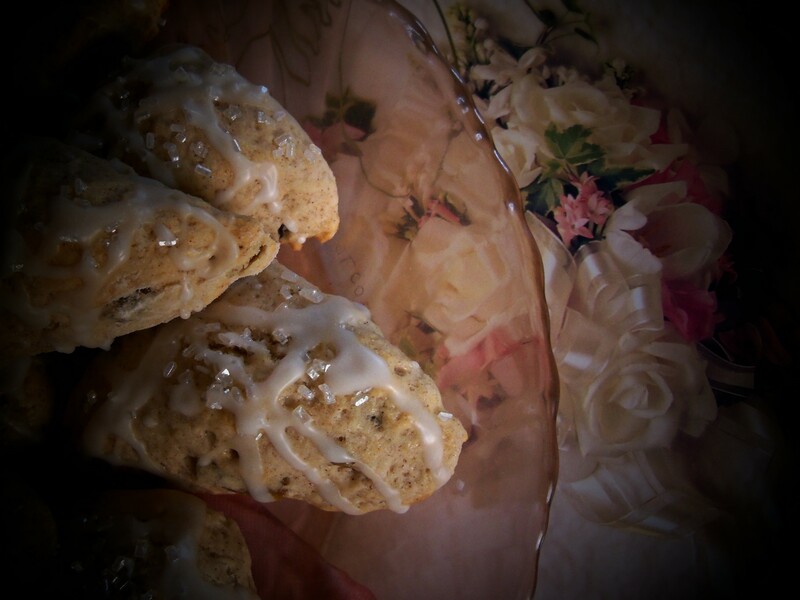 If you really want to see the scones “the way they looked,” just click on photos — I especially like the Bite Sized Baby Shower Scones photo enlarged… sigh… food and art… gotta love it! Oh Kim . . . your little poem using Alice’s name is bringing tears to my eyes! Thank you, blogging friend, for your sweet words (and the scones, which look fabulous enough that I can almost taste them . . . almost =). Dear Mom-to-be Jenna, this was a JOY to put together! I’ll be sending you the “real” version of the poem for Alice after I unpack my suitcase — just got home and haven’t had time to break out the arts & crafts yet. :) Sooooooo glad you enjoyed your shower — what a lovely group of ladies to work with — they love you (and Alice) and so do I. Happy Surprise! No kidding…how DOES she do that disappearing belly trick? It’s crazy. Very clever tie in with the poem and scones. I love it. I was thinking the same thing about your toasted orzo salad… disappearing. :) Thanks for your comments about the poem — I love doing things like that! This was fun being a part of the baby shower for Jenna. Thanks for sharing your scone recipe. I love that it has cardamom in it. There is something about that spice that makes me want to drift away on a cloud. Terri, I love your description of cardamom — I never thought of that before, but you’re right — that’s the feeling I get when I taste it (and smell it… and bake with it…), too! Jenny, I forgot to mention (in my comment on your blog) those ADORABLE shoes… so tiny & so perfect — I was wishing they made them in adult size! :) (Maybe they do?!) After I photographed these scones, I put this batch in the freezer. Thank heavens they’re bite-sized (and re-heat-able) or I’d be tasting them “in person” for the next week (or several days… tee hee!) Glad you liked them and glad to “meet” you! Cardamon!! I rarely find recipes where people use it but I love it. Thanks Kim. Have a great week. Dawn, it’s one of my favorite spices, too. :) Can hardly wait til autumn to do more baking — will see what I can come up with for cardamom recipes. Thanks so much for coming by Jenna’s shower! Veronica, you seriously underestimate your abilities… the glitches weren’t due to anything you did (or didn’t do) and I’d participate in any event you hostess in a heartbeat! My pleasure, my dear. xo! Likewise, Shirley — it’s always a pleasure to visit with YOU! The best thing about these scones is that they’re equally good plain (minus any spices) OR you can alter the spices and/or fruit to your preferences. (Forgot to mention that in my post!) Thanks for joining in the “shower.” You are such a faithful friend and I know Jenna appreciates your presence here, too! Those look fabulous! I’m a sucker for scones. :) Glad WordPress got with the program and we didn’t miss out on this. This has been fun! Stopping in to say Good Morning from the 4 little Fergusons. :) Your scones sounds amazing!